Well, i guess it is time for another "Illos.Fri" This is really a quick work. And i really really mean quick work. Less than an hour. Theme for this week is "theory". So here it goes. I believe that in order to gain what we really want, we must first recognize three things ; our mind @ brain, our heart @ passion and lastly, our legs @ actions. Having lack one of these, one might not achieve what he / she desires. Mind will be your objectives/ aims/ visions or things that you need to accomplish. Heart is your passion and action will lead towards your goals. Simply having a goal and an action will not produce an excellent result if you do not do it full heartedly. Having an idea and being passionate about it would not get you there if you do not take the action. Being passionate and simply doing it, may become unfruitful if your mind is not focused on strategies accomplishing the goals. 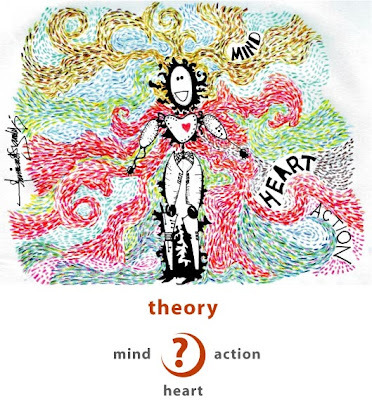 So, there you have it - mind, heart, action - represented by three group of mixed colors (brown, red and turquoise) flowing out from the said elements. Styles? Ohh, since i love Van Gogh, i use stroke-like style imitating Mr Van Gogh brush strokes. Enjoy ya. Ping, back to rattan crafts!! Remember earlier i had said about "my therapy" in my post. Well, these are few things that i have done in my spare time. I cant say that they are good in terms of skills, but i like to say here, put your mind and you may achieve your goals (cliche). Put all three mentioned above, and you may end up having something. :) So, on your left is a name card holder that you can use on your office desk; a great way to greet who ever come to your room/ desk. Not your usual name card holder one thing for sure. You can even use that rattan butterfly with your to-do notes. I have two on my office desk- as my name card holder and as post notes. Second is a bowl mixed with colored aluminum - striking red on the outside, matte gray on the inside with a slight color of uneven red on rattan. 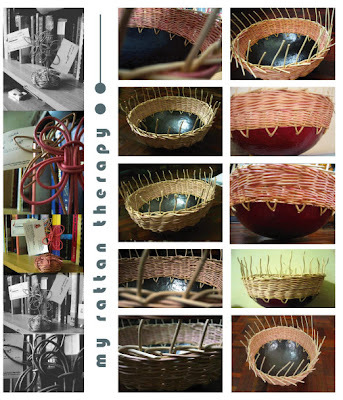 Don't expect me to weave that typical Malaysia rattan bowl / "bakul rotan." I simply leave the spoke in such a way to have that rugged look. Types of weaving are "pintal dua", "pintal tiga" and "pintal tiga songsang", nothing fancy though. I am sure that my skills are much lower than those of my students. Definitely i need more practices - practices make perfect. But, i like to stress that i do these out of curiosity trying to get the feel of weaving. I learn my way through informal learning by asking my students and seeing how they do theirs. My biggest challenge was to get the first few layers of weaving nice and tight since the spokes kept pushing them out. Well, now the bowl just needs a handful of sweet candies and chocolates and tada..it will serve its purpose. Hihi. Anyway, making these rattan crafts just prove my above theory. A little bit of imagination, a strong desire and some constant handwork, you can weave rattan too, though you have never done it before. Ohh, by the way, these are my 5th works and my 1st medium size weaving work. I guess, it will take like 10-20 medium size weaving works to get use to weaving. It is much easier designing them than actually do them..so rizal next time, have a heart on those students. haha. One thing for certain, i am deeply more in love with rattan crafts. Muaks muaks. Great job, Rizal! Love your idea! anyaman rotan tu punya base...kuali ka? hoho...walau quickie tapi aku suka adunan warna tu. "My mind always forces my body to do action, but sometimes, my heart will be in the way"
bukan kuali lah...hehehe..tuuu aluminium tempah ada ketuk2 surface dia.. tuu pun kira tempah kat member budak "fine-metal" buat secara handmade..
huhu..gambar tak shoot dekat tuu tak nampak..huhuhu..
huhu..then, one way to overcome that is by singing the famous titanic song "my heart will go on.." huhu..
yeah.. sometimes that do happen..too lazy..
bayor makan kfc..mcdonal..pizza hut selamat sebulan tok setiap tgh hari..kekekeke..
ha ahhh, kalo melaka tuu memang banyak jugak pengusaha rotan kat situ..